This is a really attractive, well-made product. At 19Lx11Wx12H, it’s far too large to work as an in-cabin airplane carrier (no matter what it says on the box), but that’s not its purpose. According to the manufacturer’s website, it’s meant to keep your pet comfortable and safe on car trips, and it will do that admirably. Here’s why I like it. It has huge mesh ventilation panels and seat belt loops on both long sides, so it doesn’t matter which way you put it into the car. It has sturdy, good-quality zippers. The bottom is covered in stronger, and probably waterproof material, which wraps about an inch or so up the body, so it’s easy to clean (and if you have to set the bag down on wet pavement, it doesn’t get soaked). It’s well-made, but still light, and when the two ends are unzipped, it collapses into a flat package, about 3″ thick (so if you’re not using it, you can reclaim your back seat). It has a sturdy and practical tether sewn inside. And it looks slick — the khaki, black and orange color scheme is unusual and stylish. 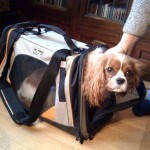 I plan to bring the cats and the dog to the vet in this carrier. It’s more spacious than Chloe’s SturdiProducts bag, and lighter than her Creature Leisure Carry Den XT, so I think I’ll reach for it more often if I need a small, temporary crate for her. 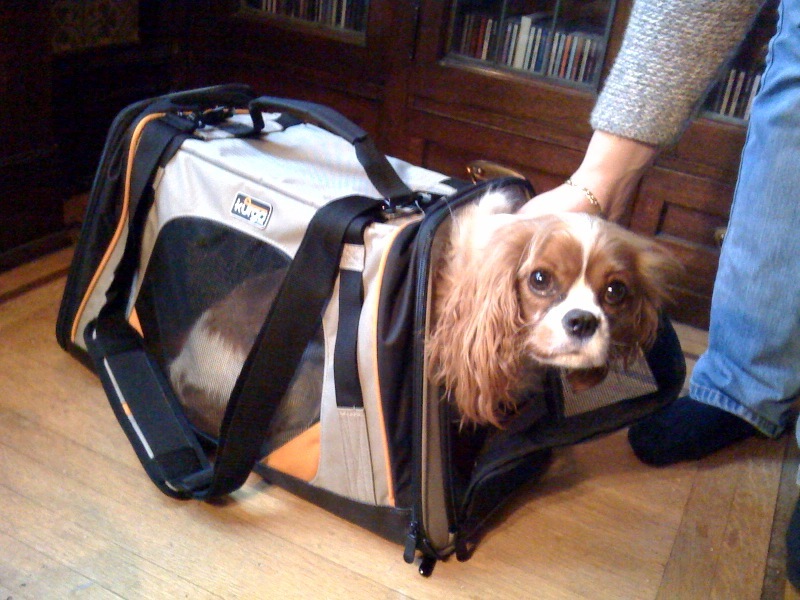 I do letterpress printing, and I’d love to have Chloe come with me for company, but you don’t want a dog wandering around a letterpress studio — this carrier would be a nice solution, I think.